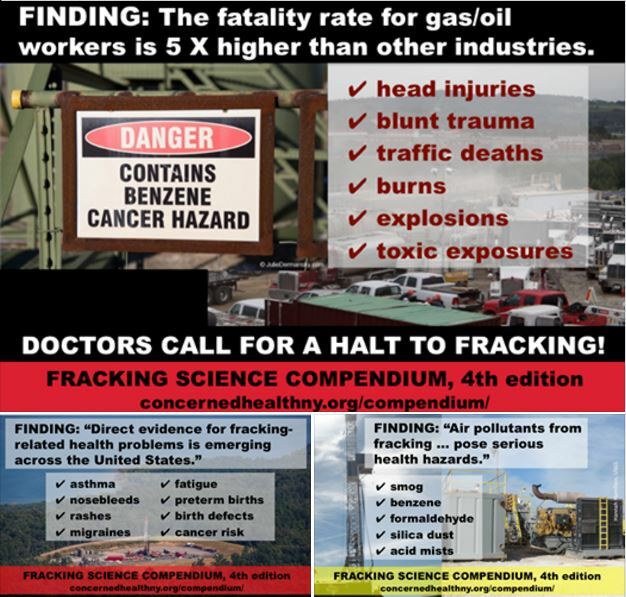 The Compendium is a fully referenced compilation of the significant body of scientific, medical, and journalistic findings demonstrating risks and harms of fracking. Organized to be accessible to public officials, researchers, journalists, and the public at large, the Compendium succinctly summarizes key studies and other findings relevant to the ongoing public debate about unconventional methods of oil and gas extraction. The Compendium should be used by readers to grasp the scope of the information about both public health and safety concerns and the economic realities of fracking that frame these concerns. The reader who wants to delve deeper can consult the reviews, studies, and articles referenced. In addition, the Compendium is complemented by a fully searchable, near-exhaustive citation database of peer-reviewed journal articles pertaining to shale gas and oil extraction that was developed by PSE Healthy Energy and which is housed on its website. For this fourth edition of the Compendium, as before, we collected and compiled findings from three sources: articles from peer-reviewed medical or scientific journals; investigative reports by journalists; and reports from, or commissioned by, government agencies. Peer-reviewed articles were identified through databases such as PubMed and Web of Science, and from within the PSE Health Energy database. We included review articles when such reviews revealed new understanding of the evidence. Our entries briefly describe studies that documented harm or risk of harm associated with fracking, summarizing the principal findings. Entries do not include detailed results or a critique of the strengths and weaknesses of each study. Because much of medicine’s early understanding of new diseases and previously unsuspected epidemiological correlations comes through assessment of case reports, we have included published case reports and anecdotal reports when they are data-based and verifiable. The studies and investigations referenced in the dated entries catalogued in Compilation of Studies & Findings are current through mid-July 2016. Some just-published papers are described above and also below in Emerging Trends. Hence, the footnoted citations here in the front matter represent studies and articles that are not referenced in the Compendium itself or which appeared “as we go to press,” that is, after our mid-July cut-off date for inclusion as an entry. Within the compiled entries, we have also provided references to articles appearing in the popular press that described the findings of the corresponding peer-reviewed study. For this purpose, we sought out articles in the popular literature that expertly and plainly reported on studies that were highly technical, especially if those articles included comments by principal investigators on the significance of their findings. In such cases, footnotes for the peer-reviewed study and the matching popular article appear together in one entry. We hope these tandem references will make the findings more accessible to lay readers. Acronyms are spelled out the first time they appear in each section. News articles appearing as individual entries signify investigative reports by journalists conducting original research. While advocacy organizations have compiled many useful reports on the impacts of fracking, these generally do not appear in our Compendium. We also excluded papers that focused purely on methodologies or instrumentation. For some sources, crossreferenced footnotes are provided, as when wide-ranging government reports or peer-reviewed papers straddled two or more topics. This fourth edition of the Compendium continues to exist within a moving stream of data. The number of peer-reviewed publications on the impacts of fracking doubled between 2011 and 2012 and then doubled again between 2012 and 2013. More studies were published in 2014 than in 2009, 2010, 2011, and 2012 combined. The number of studies published in 2015 surpassed those published in 2014 by ten percent. * Of the more than 200 peer-reviewed studies published thus far in 2016, 44 constitute original research on health, water quality, and air quality. In our review of the data, seventeen compelling themes emerged; these serve as the organizational structure of the Compendium. The document opens with sections on two of the most acute threats—air pollution and water contamination—and ends with medical and scientific calls for more study and transparency. Readers will notice the ongoing upsurge in reported problems and health impacts, making each section top-heavy with recent data. In accordance, the Compendium is organized in reverse chronological order within sections, with the most recent information first. The Compendium focuses on topics most closely related to the public health and safety impacts of unconventional gas and oil drilling and fracking. Additional risks and harms arise from associated infrastructure and industrial activities that necessarily accompany drilling and fracking operations. A detailed accounting of all these ancillary impacts is beyond the scope of this document. Nevertheless, beginning with the third edition, we included a section on infrastructure that focuses on compressor stations, pipelines, wastewater recycling facilities, and silica sand mining operations as emerging issues of concern. In this fourth edition, health risks from infrastructure are explored in even greater depth, and, in light of the ongoing Aliso Canyon disaster, have been expanded to include risks from gas storage. Many other relevant concerns— namely, oil trains, cryogenic and liquefaction facilities, processing and fractionation complexes, import/export terminals—are not included here. We hope to take up these issues in future editions. Similarly, this edition of the Compendium does not examine the harms and risks posed by other forms of unconventional oil and gas extraction, such as matrix acidizing (which releases oil and gas by dissolving rock with strong acids), cyclic steaming (which uses pressurized, superheated water to release oil), microwave extraction (which points microwave beams into shale formations to liquefy oil), and artificial lift (which uses gasses, chemicals, or pumps to extract natural gas). Given the rapidly expanding body of evidence related to the harms and risks of unconventional oil and gas extraction, we plan to continue revising and updating the Compendium approximately every year. It is a living document, housed on the websites of Concerned Health Professionals of New York and Physicians for Social Responsibility, which serves as an educational tool in important ongoing public and policy dialogues. The Compendium is generally a volunteer project and has no dedicated funding; it was written utilizing the benefit of the experience and expertise of numerous health professionals and scientists who have been involved in this issue for years. The scientific literature now includes more than 900 peer-reviewed studies on the impacts of fracking, and overwhelmingly they show risks and harms to public health and to the climate, on which public health depends. 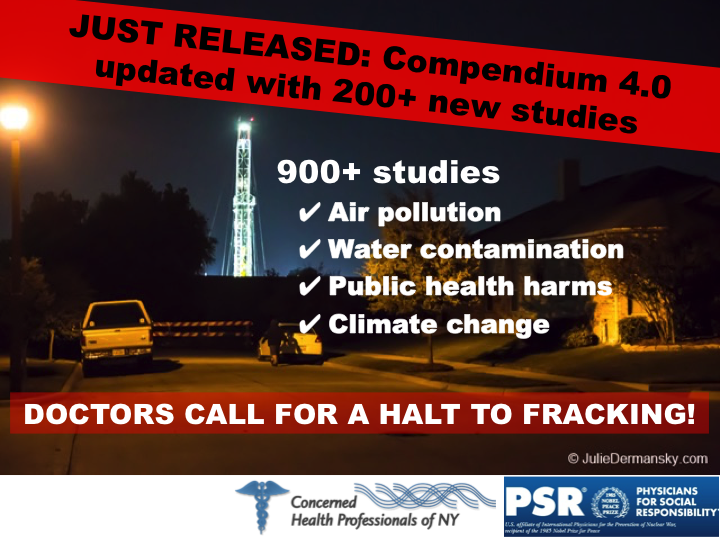 Concerned Health Professionals of New York (CHPNY), together with Physicians for Social Responsibility (PSR), have compiled plain-spoken summaries of these many studies into a fully referenced Compendium of findings and urge a halt to fracking. With 17 topical categories, 209 pages, and 924 footnotes, this long-awaited fourth edition identifies 12 major scientific trends and contains more than 200 new studies published since the third edition was released a year ago. With a much-expanded focus on the risks and harms of fracking infrastructure, including the Aliso Canyon gas storage facility, the Compendium contextualizes the issue of fracking in terms of the Paris Climate Agreement, documenting how methane leaks and emissions significantly exacerbate climate change.